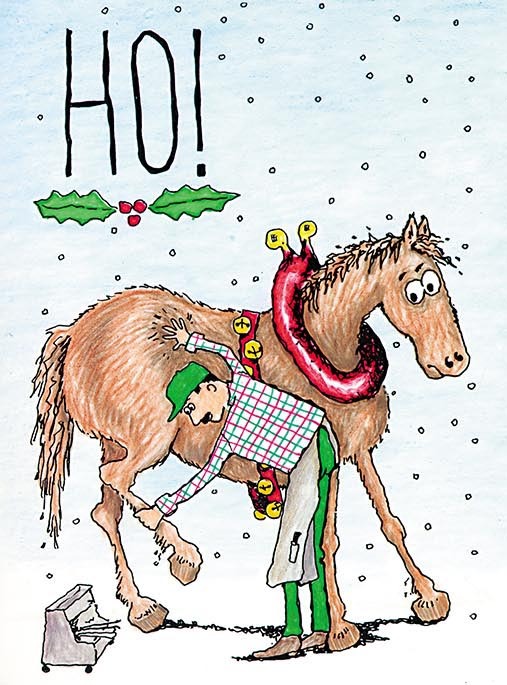 This is a humorous depiction of a farrier struggling with an uncooperative horse. His abbreviated shouts of "Whoa!" make him sound like Santa. This card is a tri-fold - it folds up with the first section showing. Inside: Wishing you a joyous and safe holiday season. This is one of the all-time favorite farrier cards. It's one of the very first created, and it showcases in a somewhat humorous light the "dark" side of farriery. We all know that yelling "HO!" at a difficult horse is probably not the most effective way to convince him to hold still, but people do it anyway. This one depicts an escalating meleé between horse and farrier with a batman-esque altercation at the end.